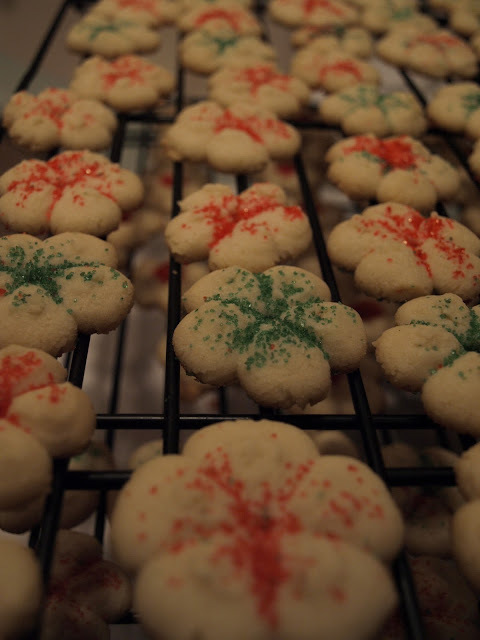 Aunt Prudy's butter cookies were a constant around the holidays. They used to just be around at Christmas (and maybe Thanksgiving?). They also just used to be called butter cookies... or Christmas cookies. I believe that all mostly changed because of Zoe. When Aunt Pru passed away this summer one of the things that came to my mind was "no more Aunt Prudy Cookies." One more thing that wouldn't be the same. So, I asked if I could have Aunt Pru's cookie press (which is ancient) and my Mom gave me Aunt Pru's butter cookie recipe (because not all butter cookie recipes are the same... I don't care what anyone says!) and I also was given a bunch of the cookie cans. 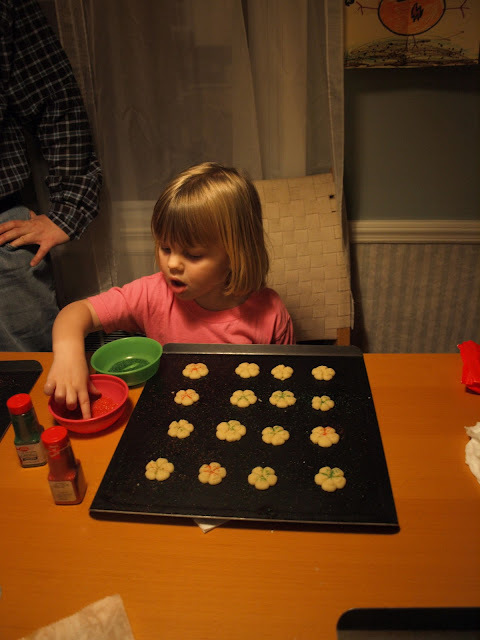 I decided that the girls and I could make it a new tradition that we would make Aunt Prudy Cookies for each holiday. I thought about making Aunt Prudy Cookies with orange sprinkles during Halloween weekend... but we had the power outage. No baking. So... Thanksgiving it is! We started cookie making on Tuesday. I know I had helped Aunt Pru with cookie decorating when I was a little girl. I can tell you I had no recollection of the dough being made. It's not difficult... but it isn't exactly a "neat and tidy" experience. I am also not a neat baker to being with. There was butter and flour everywhere. And... WOW. I know they're butter cookies... but boy is there butter! 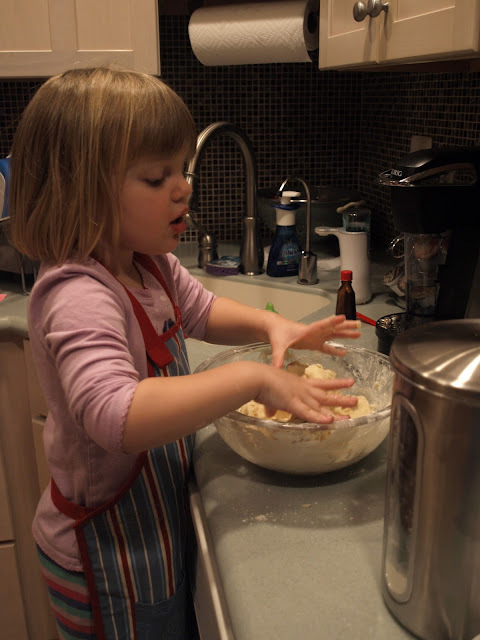 I think Zoe will be the baker in our family. 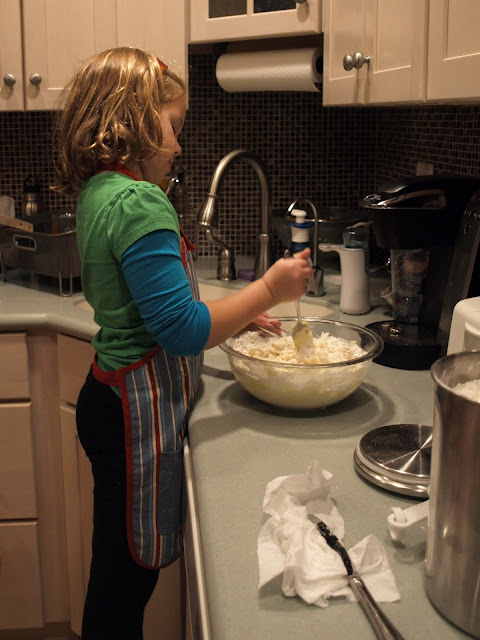 She loves finding all the ingredients, and reading the recipe, and measuring everything out, being neater than her Mommy. She's a stickler for the details. I mean really... have you ever seen such a neat work space? There also might have been a little dough eating and finger licking. Maybe. Then came the really hard part. I had to figure out how to use the cookie press through memory and trial and error. After some issues where NOT ONE SINGLE COOKIE WOULD STICK TO THE COOKIE TRAY (breath breath breath), and someone may have cursed under her breath a little... I called my Mom for some pointers. Who knew butter cookie dough should be "pressed" at room temperature??? Certainly not me. And here I thought I was being so good refrigerating the butter dough. Then I would get spurts of perfect cookie, perfect cookie, perfect cookie, dud, dud, dud. 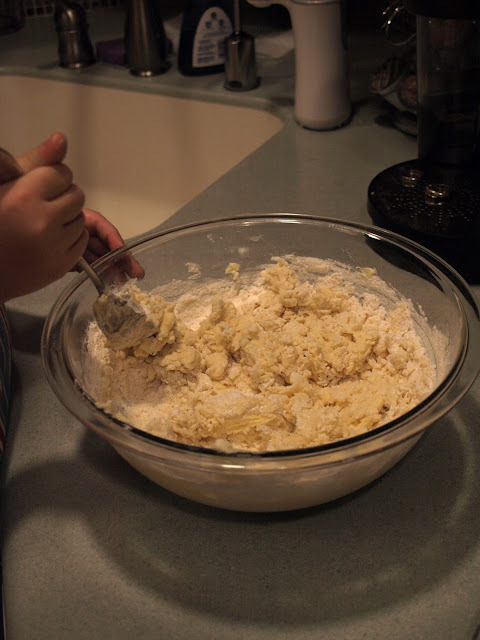 Making Aunt Prudy Cookies was a work-out. My right hand hurts from squeezing, my left hand hurts from holding, my back hurts from bending, my knees hurt. Phew. I earned all of the butter cookie calories I'm going to eat this weekend! The favorite part of the baking experience was probably the decorating. We may have sugar sprinkles on our floor from now until Christmas, but I think the end result was worth the experience (for me at least). We even got Nick in on the decorating a little bit. It was a big family ordeal... er... activity. 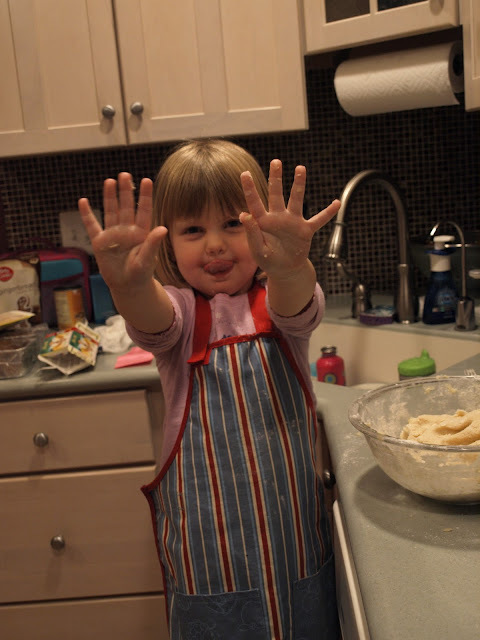 We made it through 2 batches of cookie dough baking on Tuesday afternoon (into evening). The other 2 batches of dough had to wait until Wednesday. (Mom... what did I ever do to you that you told me I should start out with 4 batches of dough? I thought you loved me!?!) 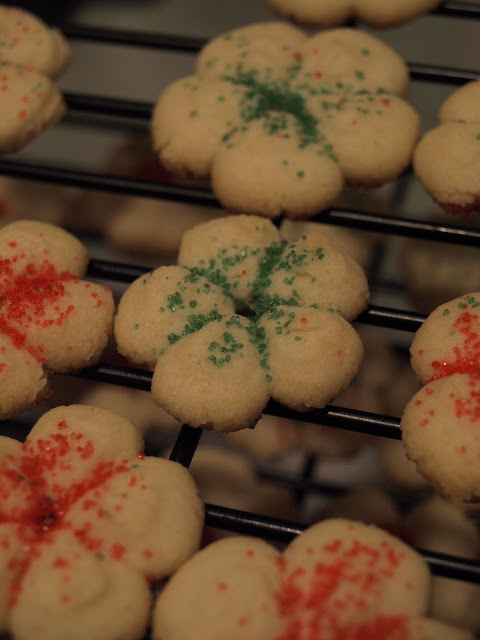 I don't know how Aunt Prudy made these cookies all the time... I was ready to chuck that cookie gun out the window before I finished the first cookie sheet! I will say it got easier as we went along. It was much easier for me on the second day. The cookie press seems to be very temperamental. Or maybe it's quirky and I just have to figure it out. All I know is... we have Aunt Prudy Cookies... so a little bit of Aunt Pru will be joining us at Thanksgiving tomorrow.